Today, I’m asking for 3 minutes and 27 seconds of your time. I know you’ve donated a gazillion strings of 3 minute increments to watch “Shake It Off” spoofs, dogs doing funny shiz, and the epic Jimmy/Bradley laugh-off. This vid is not like those. You probably won’t die laughing however you might be inspired. Some of my colleagues implemented this in 2014 and each month they chose a new goal and then everyday for the month they did it. It doesn’t have to be mind blowing – just something. What do you want to add to your life for 30 days? What do you want to subtract? 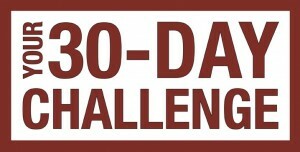 Whether you take the challenge or not, the next 30 days will peel off of the calendar. Why not do something intentional? Maybe in February you don’t eat any chocolate. Maybe everyday in March you write a note (could be a letter or a sticky note on a windshield) to a friend, family member, child’s teacher, neighbor – 31 different people – and tell them why you admire them or what positive impact they’ve had on you. Maybe each month you go bigger and before you know it you are sitting here in December 2015 looking in the rear view mirror saying wow – look at what I did. This Smarty checked out her own ta-ta’s!